Deploying Sophos UTM in a High Availability pair allows for continuous uptime of the Sophos UTM services in the event that one of the UTM nodes fails. Failures can occur due to hardware or system crashes on the UTM, or in a virtual environment the failure can occur on the hypervisor host itself. A common example of this is routine periodic patch cycles that require a reboot of the host. In this mode, both nodes are actively handling traffic. This mode allows for increased throughput in your UTM environment since all nodes are doing their share of the workload. In this mode you have a primary or master node that is handling all of the traffic. The other node is ready and waiting to take over should the master fail. This mode allows for high availability but without the performance gain. Due to the way Sophos UTM is licensed, this is a very attractive deployment since only the active node needs to be licensed. In a virtual deployment you don’t even need to purchase the UTM hardware. It is therefore almost a given that if you have enough virtual infrastructure you should be running an Active Passive pair. You can change your deployment from Hot Standby to Cluster but you cannot change it back. You would need to perform a factory reset on the devices before you can break the cluster. In this article, I will take you through the steps to deploy Sophos UTM in Hot Standby mode using Hyper-V. I am going to build the Active – Passive High Availability (HA) deployment over two hyper-V hosts. This is typical since the hardware failure of a single host should not affect both of your Sophos UTM virtual machines. This of course, means that all of the steps below need to be configured on both hyper-V hosts. NOTE: Although it is possible to build a HA pair on a single Hyper-V host, it does not work 100% due to the way MAC spoofing is handled. Create three switches that correlate to the networks. All three switches are of the External Type. I suggest using a crossover cable for the heartbeat network. It is rare for switch gear to fail but you don’t want a power outage on the switches to cause your HA cluster to start failing back and forth. The requirement is also for the replica to support broadcast UDP, which may not be enabled in your switch infrastructure. Both virtual machines need to be identical from a network interface perspective so take extra care to make sure you get this right. Double check to ensure that the interfaces of the host itself do in fact bind to the desired network. Attach the network adapters in order. This should ensure that they are identified as eth0, eth1 and eth2. 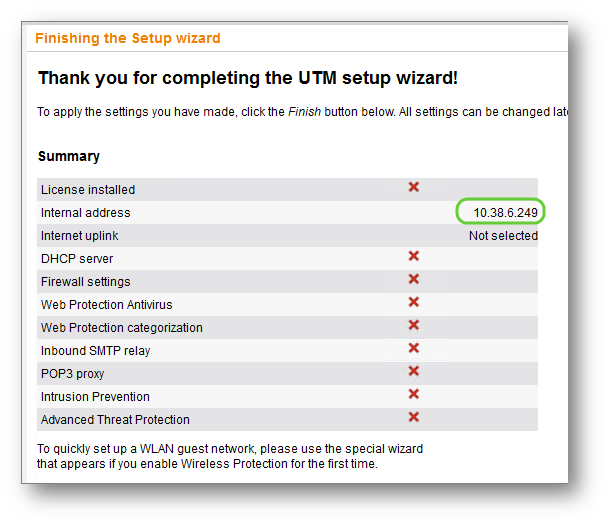 Start both Sophos UTM virtual machines and step through the normal build wizards. You can follow http://fastvue.co/sophos/blog/how-to-deploy-sophos-utm-on-hyper-v-in-7-simple-steps/ for details on each wizard page. The most important step in this process is to ensure you use a unique IP when prompted to specify each UTM’s internal interface. Each Sophos UTM must have its own unique management IP address. Once the build is complete I suggest taking a virtual machine checkpoint/snapshot. If you need to rollback for any reason, this is the last time the VMs will be totally unique and separate from each other. We are just going to proceed with a basic setup of each Sophos UTM. Once the Virtual Machines are joined in an HA pair the configuration will be automatically synced between the nodes. It is of course possible to add a HA node to an existing, fully configured, stand alone UTM. Just ensure you have local copies of the backups. The only difference between the Sophos UTM nodes should be the hostname. After the initial build cycle, log back in and step through the initial set up wizard as set out below. Again, this will be the same on both nodes, with the exception of the Internal IP address. Up to now you have configured two UTMs to be nearly identical. In this step you will merge the configuration on the two devices. The individual management addresses will fall away, one of them will be selected as the shared virtual IP that will be used from now on to manage the HA pair. At this stage, the initial sync will be performed. This will cause you to be temporarily disconnected from the web interface. The sync could take a while to complete, be patient. I set up continuous pings to the two management IP’s. When one stops responding you know things are working away in the background. After a few minutes you will be able to log back into the web interface. You can check on the progress by selecting the Status tab from the Management | High Availability section. Once the two nodes are in sync, you will see the status change from SYNCING to READY. At this stage you have a working HA Active – Passive pair! Managing the HA Pair can now be performed through the single management interface. All changes will automatically be replicated. Now that the configuration is online, you can set the High Availability | Configuration | Advanced Settings. The preferred master is the node you want to prefer to always own the role. In the event of the cross over cable being accidentally unplugged, the backup interface setting will keep the nodes from erroneously failing over and fighting over the virtual IPs. Testing the fail over is a simple process but it pays to do the due diligence here. From the High Availability | Status tab, take turns to reboot each node member one at a time ensuring that the management IP does not go down during the switch over. A simple continuous ping is a great way to track it. In my testing I found that switching from one node to the other resulted in a single dropped ping. When the nodes reboot you will notice an extra start up process for the High Availability modules. There is a built in check and you can see which interface is being used to listen to the heartbeat. This adds about 20 seconds or so to the initialising time, so it is easy to spot. For troubleshooting, you can look at the HA live log. Although the log entries do indicate what is happening, they are not 100% clear or intuitive. It helps to understand what healthy log looks like, so when everything is running smoothly, make a copy of the log for future reference. 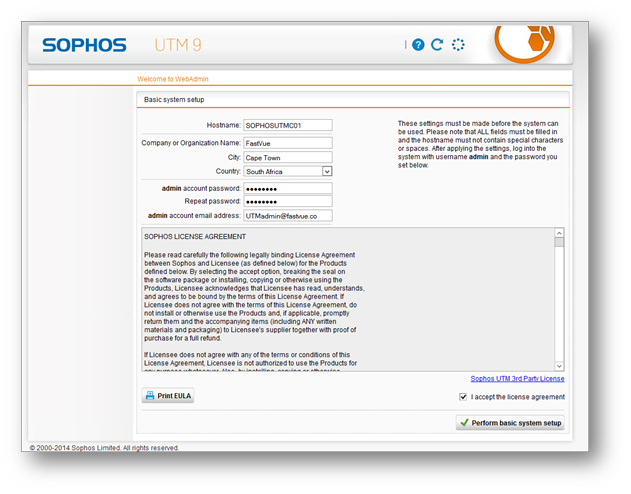 Sophos UTM is a great product that comes with quality features at a reasonable price point. From a licensing perspective, virtual deployments can essentially be upgraded to a Hot-Standby HA pair at no extra cost. It is a relatively simple process with some significant advantages. You do not need your Sophos UTM to be installed on a Highly Available Virtual Machine with all the requirements that come with it. You simply run two standard virtual machines. Being able to elect a preferred master also allows you to run your standby node on lesser hardware for those “in case” scenarios, knowing it will fail back to the preferred hardware when it is available. I hope this helps anyone looking to deploy a Sophos UTM High Availability Hot Standby pair for the first time. Please let me know how you go in the comments! Could you possibly include some form of flowchart / diagram for how the physical connections work? One thing to keep in mind is that while you are configuring the pair they are unique, seperate IPs and so on. Once you create the cluster they logically become the same thing. So while configuring you may specify two external IPs (one per host) the second will not be used once the cluster is formed. So in that respect you only need one. I have not tried to build with a route in bridge mode but the logic would be the same. As long as you can physically patch the two physical nics into the same layer 2 device you should be good. Hope this answers the question, if not just give me a shout. Thank you for this great manual for setting up a Sophos UTM HA. There’s no need to have a fresh installed slave. You can bring a secondary UTM with full configuration to HA mode. I tried this because I first tested the single UTM on my secondary ESXi host before setting up the HA mode. One thing is good to know and so it should be described in your post. The reporting data is taken over from that node which is set up to HA mode first. I made a mistake because I first set the newer node to HA mode and so my reporting data of the last years, months and days are gone away. It’s not really bad for me but it’s possibly important for some people. potentially you could get it to work if you set them up individually, however this won’t be recommended or supported by Sophos… and could cause you issue if / when the fail over kicks in. Can you add any details about how HA works with Active Directory SSO? Are there 2 computer objects in AD or only one? In order for SSO to work you have to use the exact host name when using it as a standard proxy. Not an IP address or DNS alias. I’m curious if HA is compatible with SSO. Once you create the HA cluster the one becomes a clone of the other. You will just have one AD object that will move between the devices. One of the nice features with the UTM is that is is very extensible from an authentication perspective with various modes available to you. It also seems to handle NTLM and Kerberos authentication very well even from non Windows clients like Mac OSX and Linux. If you have any feedback on your own test it would be great to hear! Could you clarify the Static Mac Address requirement? in a HyperV setup with 2 or more Virtual UTMS.. should the MAC address be the same or should they be different on each system. There’s not great documentation from Sophos on this, but in my experience with this and other similar systems the following happens. The reason you have to enable MAC address spoofing is because the UTM will create a virtual MAC address that will be used by the active node. This virtual MAC moves with the Virtual IP address. So the individual node have their own “dedicated” static MAC addresses but the cluster has a “floating” virtual one. I am trying to setup UTM HA cluster ( Active/Passive). We have internet link from two different ISPs for redundancy. Both ISPs have provided us devices and a single cable runs from each device and is terminated in Sophos UTM. Now, when we are adding second UTM, we are unable terminate the internet links in second UTM as there is only single cable runs from ISP device. Should we ask ISP to change his device or we should add switch between ISP device and UTM ? And do we need to one or two switches. It looks like you are talking about a physical UTM appliance and adding a second physical UTM, regardless the solution would actually be the same. If the devices you were supplied by the ISP only allows you to connect a single cable you actually do not have a choice other than to put a switch in between. The good news is that you can get away with using a single basic Layer2 un-managed switch for this. It sounds like you would only need 6 ports which means an 8 port switch would be suited and give you a little breathing room for further addition. Thank you so much Etienne.. That’s exactly what I wanted to know. Hi, thanks for this useful guide. I have set up a HA but have that issue that if both devices are active I have internet connectivity issues, i.e. pages are not loading completely/at all. As soon as I shut down one of the nodes it is working fine again. I am running on ESX6, HA is working fine (ie either of the two is working perfect without the other). I am sure it has to be something simple but I cant find it – any idea? My experience with ESX is not limited so I am not expert on that. Having said that, it sounds like the issue is related to the load balancing where the MAC addresses are spoofed and shared between the nodes, if ESX has not been configured to allows this you would have issues. Hope that points you in the rights direction. Is there any way of identifying the virtual interface/mac from Sophos CLI?